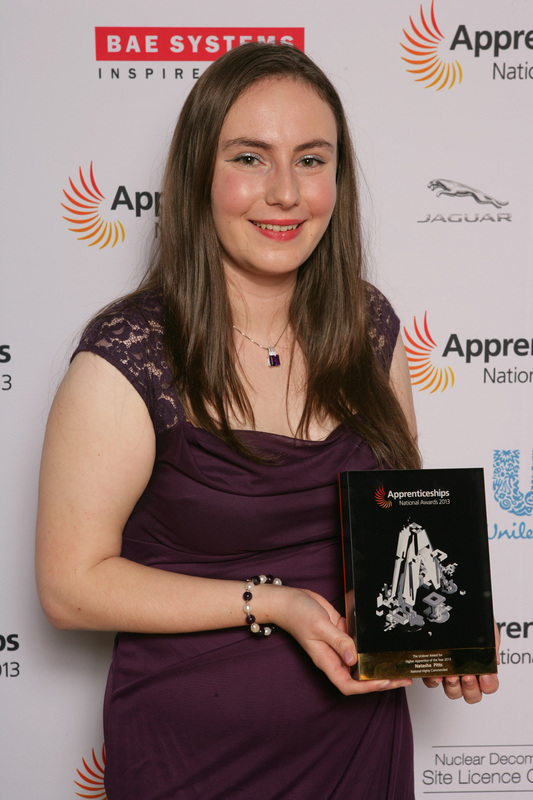 Dale Power Solutions‘ Higher Apprentice, Natasha Pitts, was honoured at the National Apprenticeship Awards last week, taking home the Highly Commended award in recognition for her exceptional work as a higher apprentice. Natasha has worked at Dale Power Solutions since September 2010 on an Advanced Apprenticeship in electrical and electronic engineering. She completed her Advanced Apprenticeship 2 years early and progressed onto a Higher Apprenticeship. Natasha’s Apprenticeship has helped her to become a valued team member and is seen as a star of the future and a role model to all apprentices. She has helped to develop training equipment for Dale Power Solutions training partner (Derwent Training) to enhance the learning experience of other apprentices. Natasha is very passionate about engineering and science and is very proud to promote engineering and the power of apprenticeships in local schools through her role as a STEM ambassador and encourages young people into stimulating, rewarding and enjoyable careers through an apprenticeship. This entry was posted in Case Studies and tagged Advanced Apprenticeship, apprenticeship, Case Study, Dale Power Solutions, Electrical engineering, Natasha Pitts, The 5% Club by 5percentclubuk. Bookmark the permalink.